As we prepare to celebrate Thanksgiving Day in the US, it seems an appropriate time to give thanks to the many equines who have graced my life. I have learned something from each horse I have worked with, building a deep tool box with all of their lessons. In particular, I’m taking this moment to give thanks to those horses, past and present, who taught me the most significant lessons. To Wicki, who taught me to “shut up” unless I had something of value to say. cross-country but was trying to do all that my instructor told me. I was trying to “manage” him throughout the course, rating his stride and trying to ride him to every spot. Wicki had been around the block more than a few times, and well knew his job. Halfway through the course, as we approached a raised log with a downhill run on the landing side, Wicki had enough of me. As we approached the fence he took control. He did not bolt – he just stopped listening to me. I had steering and that was all. So, I steered and went along for the ride … and he never missed a spot! From that day on, I began to understand that if I just let him do the job he knew so well, he was more than willing to listen when I had something important to say. His next rider never learned that lesson, and resorted to all sorts of gadgets to try to manage him, instead of learning to listen as well as speak. One of my favorite memories was watching them on course one day, her fighting him all the way. As he galloped across a field I could see the moment coming. I poked the person next to me and said “Watch this!” In the next moment, Wicki pulled his head back and slightly to the side … and then gave a huge yank, pulling the reins completely out of her hands. He then continued to gallop calmly on, making the turn toward the next fence on his own and continuing on with his rider scrambling to regain her reins. To Ben, who taught me that having a “storybook” relationship with a horse can be a reality. Me and my buddy, Ben, in our first year together. step in three-day eventing, with the talent, speed and size to take me further than Wicki could. But he had other ideas. For several years I struggled to make a cross-country horse out of him. He had the talent to jump the moon, and loved to go galloping around the farm fields – but there was something about cross-country that did not sit well with him. What made it worse was that it was site specific. He ate up some cross-country courses, jumping everything I presented … even schooling over preliminary and intermediate level fences. Yet, other courses saw him unwilling to leave the starting box, and his reaction to the smallest fence was to stop 20-30 feet away and plant his feet. In those cases, there was no moving him. For most riders, that would be the signal to sell the horse and get another. 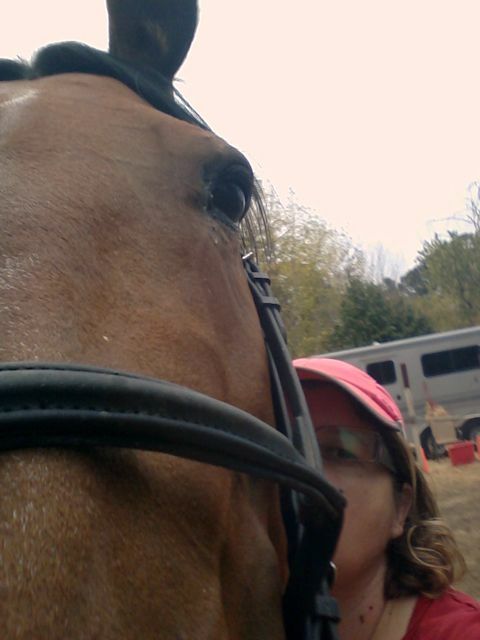 I loved eventing … but I loved Ben more. 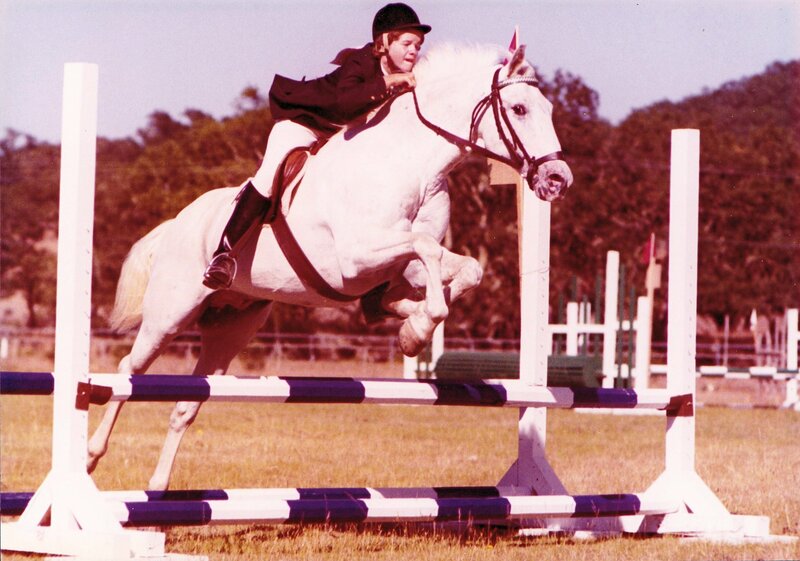 So, we did what he liked – hunters and jumpers – and we had fun. Along the way, I also developed my passion for Dressage, and he indulged me. I was rewarded with a relationship that most young girls dream of. I could call him from across a field, and his head would fly up with a trumpeting whinny in reply. If he was not confined in some way, he would then gallop up to greet me. He was in the habit of taking afternoon naps, curled up in his stall. On occasion I would join him, my arm across his back and my head leaning on his withers. No matter who was riding him, I could tell him “whoa!” and he would. He literally saved my hide on a couple of occasions, and granted me the trust to return the favor on a couple of others. 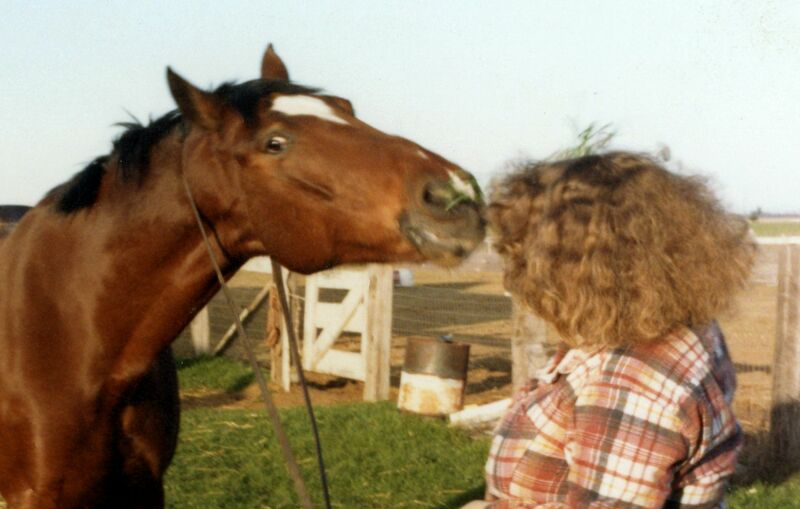 He was my equine soul mate, and letting him go after twenty eight years was the hardest thing I’d ever done. To Dani, who taught me that there is always a “backdoor” to every problem. 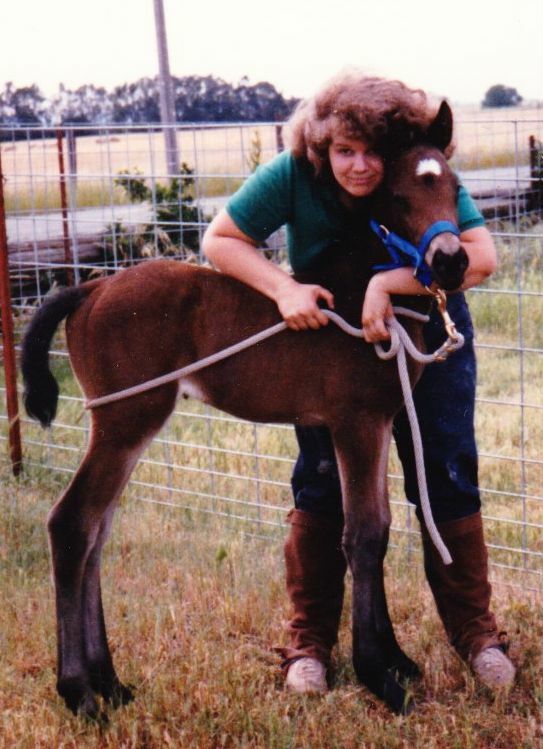 My first “cradle to grave” horse , she grew up as an unlikely Dressage horse – lanky and spindly with unspectacular gaits. I nearly sold her as a hunter/jumper prospect. But I took her to my Dressage trainer for some lessons, just to improve her flat work, and we uncovered an impressive talent. In an exercise working “toward” canter pirouette, just to improve her engagement, all humans in attendance were equally shocked when it actually turned into a correct half-pirouette! As talented as Dani was, she was rather hot and impetuous – qualities preferred by top riders today, but frowned upon in those days. One international clinician even labeled her “very talented, but insane”, while another called her a complete waste of his time. I had worked with a wide range of horses by this time, but none with the hair trigger she had. If she was in a good mood, she would give me everything she had. If it was a bad day, everything was an argument. I learned my lesson the day I tried to push through her ill temper, and we nearly went over backwards! Even Dani seemed a bit shaken by the experience. From that day, I realized that pushing her was not an option. On her good days, we made great strides; and on her bad days, we took baby steps. Maybe we got one good walk-halt transition … or maybe I found the path through a “back door”. She taught me to be creative, and to learn to let go of always doing something “by the book”. And she taught me that Dressage really could feel like a dance, with two bodies moving effortlessly as one. To Tally and Noble, who are teaching me how amazing the equine ability to forgive can be. Tally and me, looking forward to our future together! a foal whose life experience was that all humans caused pain but one, it was fully understandable. Tally’s situation was caused by my own bad decision to send her away for training. But whatever the cause, avoidable or not, both horses had serious issues with trusting humans. Past experiences have helped me in finding approaches to their respective issues – but I’ll admit that I had little expectation for the outcome. I had not encountered such challenging issues, and such complete lack of confidence and trust before. I knew I would make progress, but I was not sure how much. I have been completely humbled by just how far both horses have come, and by how much trust they clearly have in me now. I don’t know what the future holds for the three of us, but I know that it will be “til death do us part”. To all of the horses who have brought joy to my life. I have been involved with horses for most of my life. They have been a part of our family for nearly forty years. Over that time, my level of involvement has been everything from full immersion to simply caretaking. I have contemplated, at times, the simplicity of not having any more horses. But this year has clearly reminded me of what I’ve lost sight of at times – that there is not much in this life that has brought me the pure joy that horses do. This entry was posted in My Journey and tagged a lifetime with horses, Ben, horses and teachers, lessons learned, Noble, Tally, Thanks, Wicki. Bookmark the permalink. That is quite the impressive list of steeds. Impressive the most because you kept them so long. What a wonderful horse life with such great teachers!